can be, and the results are simply stunning. This stunner uses larger-than-average accent stones in the halo to create a scalloped effect. Two even larger accents at the top and bottom of the center stone elongate the design, giving it an almost Marquise-shaped silhouette. This is vintage elegance at its finest. This design is an incomplete halo with a bypass setting. The band flows around the top and bottom of the center stone, creating a semi-halo. With its simple, unadorned shank and unusual design, this ring draws on vintage influences but updates the look to be undeniably modern. This bold double halo design surrounds a Cushion cut center stone. The inner halo is a classic row of small Round cut accents, while the outer halo is formed with large Oval cut stones set end to end. The split band visually balances the large halo and completes this glamorous design. This clever design uses a Princess cut center stone and echoes the squared corners in a layered halo to create the look of a blooming flower. The theme is carried through the band, as well, which evokes the look of a leafy stem or vine. It blooms with beauty! 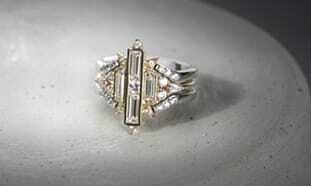 This side halo design focuses on the profile of the ring. Teardrop-shaped metalwork set with accent stones gives it the look of a queen’s crown. This piece takes inspiration from interwoven trellis setting and combines it with a halo design to create something truly special. Which custom halo design is your favorite? Fit for a Princess looks stunning and will sit on an engagement finger as beautiful as a crown. Okay, the first one, hands down. The top one is exquisite, as are the last two. I love the Glam Double Halo. It would look glorious on my hands.